The Literature of the Indian Diaspora: Theorizing the Diasporic Imaginary constitutes a major study of the literature and other cultural texts of the Indian diaspora. It is also an important contribution to diaspora theory in general. 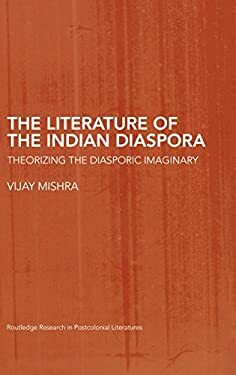 Examining both the 'old' Indian diaspora of early capitalism, following the abolition of slavery, and the 'new' diaspora linked to movements of late capital, Mishra argues that a full understanding of the Indian diaspora can only be achieved if attention is paid to the particular locations of both the 'old' and the 'new' in nation states. Applying a theoretical framework based on trauma, mourning/impossible mourning, spectres, identity, travel, translation, and recognition, Mishra uses the term 'imaginary' to refer to any ethnic enclave in a nation-state that defines itself, consciously or unconsciously, as a group in displacement. He examines the works of key writers, many now based across the globe in Canada, Australia, America and the UK, - V.S. Naipaul, Salman Rushdie, M.G. Vassanji, Shani Mootoo, Bharati Mukherjee, David Dabydeen, Rohinton Mistry and Hanif Kureishi, among them - to show how they exemplify both the diasporic imaginary and the respective traumas of the 'old' and 'new' Indian diasporas.